Orson Welles had just had a screaming success as director, producer and star of Citizen Kane when he was approached to play the part of Harry Lime in The Third Man. Tempted by the chance to embody the mysterious titular character who, while only appearing in ten per cent of the movie, manages to steal the entire show, Welles came onboard but not before holding out long enough to secure a hefty fee for his contribution. It was worth every cent because he brings with him a palpable presence, one that reeks of self satisfied cynicism. And by throwing in a shocking improvised speech about the benefits of dictatorships over democratic systems, Welles ensured the creation of yet another unforgettable screen character. 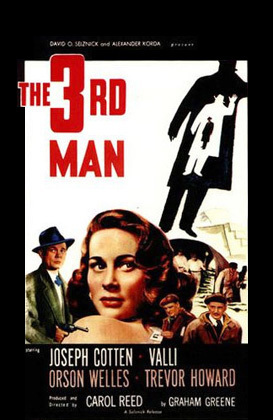 Shot on location in post-war Vienna, The Third Man explores the shady world of black market racketeers through the eyes of pulp Western writer Holly Martins (Joseph Cotton) – the alter-ego of scriptwriter Graham Greene. Holly comes looking for Lime but finds instead his grieving girlfriend (Alida Valli) and a city divided between the French, Americans, British and Russians. The once grand Austrian capital is in tatters – in one scene, a pile of rubble that once was the Gestapo Headquarters can be seen being raked over by tiny figures. But there are still some wonderful old buildings left standing; Harry’s own residence, for instance, is flanked by two colossal classical figures which dwarf the performers who gather there, many of them extras plucked straight from the streets. Australian born Director of Photography Robert Krasker captures the devastated city using slightly skewed angles to unsettle the viewer. Shadows loom large on walls, light falls sharply across faces and the cobbled Viennese streets shimmer with reflections. He won an Academy Award for his black and white cinematography and the film itself took out the Grand Prix at Cannes. Even the soundtrack, featuring a folksy zither, stormed to the top of the charts although now it seems to undermine the more dramatic moments which come thick and fast in this classic taut noir thriller.